The Badia a Passignano in the Chianti region of Tuscany. The hills of the Chianti stretching between Florence and Siena comprise one of the world's most famous wine-producing regions. 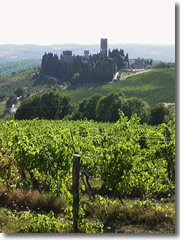 The steep slopes are cloaked in terraced rows of vines and peppered with medieval castles and cypress-shrouded abbeys. 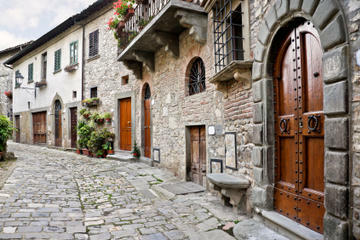 The narrow valleys are laced with tiny rivers along which are sprinkled small market towns: Greve in Chianti (the unofficial capital of the Chianti), Radda in Chianti, Gaiole in Chianti. The Chianti is the perfect place for a countryside getaway—and a great base for exploring Tuscany for the comfort of a rental villa or country hotel. At the very least, avoid the speedy SS2 Via Cassia highway to get between Siena and Florence and instead take the slow road (the SS 222, a.k.a. the Chiantigiana) on a day-long tour of the Chianti's wineries, winding your way leisurely though these misty, wine-sodden hills between Florence and Siena. As a general rule you'll want to call ahead at least a day or two before heading out to any winery. Some of the slicker commercial operations allow you just to drop by and get on a tour, but many require you to book a tour in advance, often a day or two (sometimes a week). The 12th century Castello di Verrazano is the hilltop castle where Giovanni da Verrazano was born in 1485 (later to sail out of the Chianti and discover New York harbor, which is why we named that big old bridge after him). Hour-long tours of the gardens and cellars run Monday through Friday from 11am to 3pm). Book ahead at least a day in advance (tel. +39-055-854-243 or 055-290-684; www.verrazzano.com). The monks who live in the postcard-perfect thousand-year-old Badia a Passignano, a castle-like monastery wrapped in a cypress grove atop vine-stripped hills and olive groves, no longer tend to the wine-making; that's in the hands of the massive Antinori wine empire (www.antinori.it). Monday to Friday you can visit its osteria (tel. 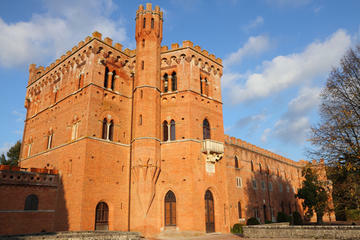 +39-055-807-1278, www.osteriadipassignano.com) to tour the cellars and buy the wines produced here (tel. +39-055-807-1622). Tours of the monastery itself are only given Sundays around 3pm. The Russet-orange villa surrounded by cypress and elegant gardens called Villa Vignamaggio will look oddly familiar to Kenneth Branagh fans. This is where he filmed Much Ado About Nothing—but the 14th-cetnury villa's fame goes back much further; this was, after all, the childhood home of a young girl who would grow up to pose for a painting by Leonardo da Vinci and become known as the Mona Lisa. Now the joint's owned by a Milanese former banker, who has revived the wine making (and turned most of the out buildings in a rather chic agriturismo, or farm stay operation » more). Book ahead at least a week ahead to tour the cellar and those ornate gardens, on Tuesdays and Thursdays only (tel. +39-055-854-661; www.vignamaggio.com). The Castello di Volpaia is another looker, a medieval stone borgo (village) around a crenellated tower, and the winery is actually installed in the series of houses and buildings of the village itself (all connecting pipes, tubes, and electrical wires have been seamlessly hidden underground and within walls, so the exterior effect is as medieval as it gets). Tours are run every day but Saturday, but call ahead—and try to do so a week in advance (tel. +39-0577-738-066; www.volpaia.com). My favorite Chianti is that produced by Dr. Laura Bianchi on her family's Monsanto estate in Barberino Val D'Elsa—one of the first two wineries to switch over to producing a fully Sangiovese Chianti (actually, they started doing it back in 1974, waaaay before it was legal to deviate from the official grape formulas). They also do a mean Chardonnay. The cellars are also pretty evocative, modeled after an Etruscan tomb found on the premises, and including a hall of niches covered by iron grates—and hovering between being Cask of Amtillado-creepy and aw-isn't-that-sweet cute—where bottles are set aside for each family member when they are born, to age and be ready for them to celebrate a wedding or some other major life event in the future. They also now run an agriturismo on the property. Reserve a tour at least a few days ahead of time (tel. 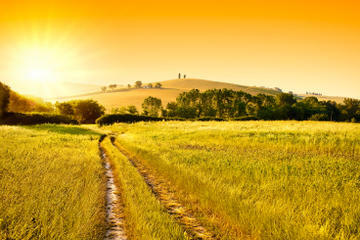 +39-055-805-9000, www.castellodimonsanto.it). Wine-tasting at one of Chianti's most renowned castle-farm estates, scenic drives through magnificent Tuscan landscapes, visits to ancient villages, and a traditional dinner an old village among the Tuscan hills - is there a better way to spend the afternoon in Tuscany? Chianti wineries increasingly welcome drop-in visitors, especially during the summer high season, but most do not—and many offer cellar tours or on-site wine tastings only a few days a week at set times (this is especially true in the off-season). It's always wisest to call ahead to check when they're open and, if necessary, reserve a tour. 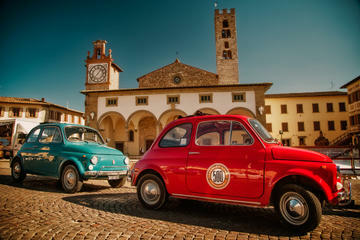 Reserve a guided tour of the Chianti from Florence via our partner site Viator.com.